Sandhills Community College already feels like home to Autumn Norton. 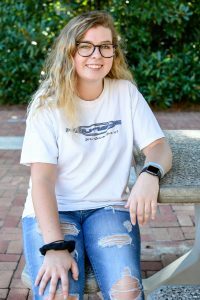 As a University Studies student, Autumn learned about the college when she was at Union Pines High School and enrolled in Career and College Promise dual-enrollment classes. 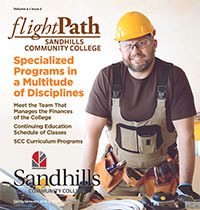 To Autumn, Sandhills has the feel of a hometown school, but with university-level education. Besides taking classes, Autumn was selected to be a Student Ambassador. In this role she’s looking forward to meeting new people, and influencing prospective students when giving tours. Autumn works part-time as a park ranger and boat dock attendant at San-Lee Park in Sanford, and in her free time she’s usually on social media or watching a Buzzfeed video with her sister. Looking toward her future, Autumn plans to transfer to UNC-Chapel Hill to earn a biology degree and then enroll in their dentistry program.